The aim of the bunded cage is to improve the removal process of the plastic container that stores used wax. For this reason it is critical that the bunded cage can easily house a euro pallet. The bund features a base fabricated from 3mm mild steel plate fitted with a removable open grid top and a threaded 2″ BSP outlet. 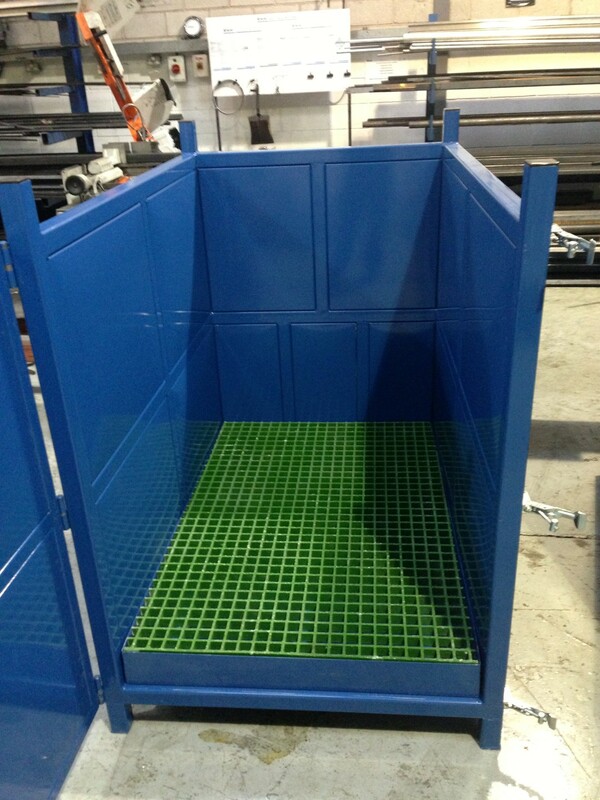 The Cage is fabricated from 50mm box section and 2mm panels with a continuous hinged door that is held closed using 3 off heavy duty adjustable latches. The body of the bund tapers 50mm front to back (front widest) to allow easier removal of the wax block once it’s cooled. The sides and rear panels are reinforced with box section to prevent billowing as is the door. It is powder coated to give a hard wearing durable finish. BS 4800 20 D 45 (Blue). Approx. size: 1300mm (W) x 950 (D) x 1325mm (H).